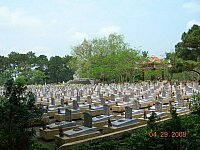 Situated in Gio Linh district, Truong Son cemetery contains about 15,000 graves containing the remains of Vietnamese soldiers and civilians who died in defence of the Ho Chi Minh Trail. 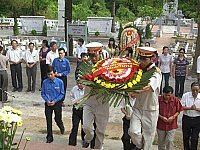 During the conflict, the North Vietnamese didn't have the resources to retrieve and transport bodies back to their home village, as they did in the south. 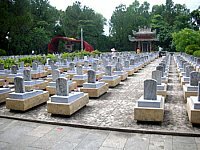 So the dead here were often buried where they died, if they were buried at all. 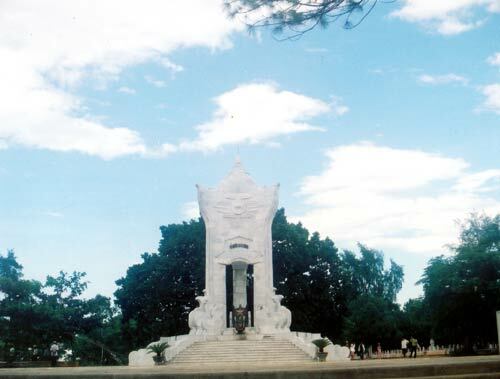 In the Vietnamese tradition, the soul of a body not buried properly will not be at rest, so after the war, as many of the remains as possible were retrieved and interred here -- but only a fraction of the estimated hundreds of thousand who died actually made it here. 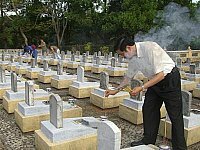 The graves are arranged in concentric circles by province and hamlet -- Vietnamese come to offer prayers for the dead, and even if they can't find the grave of the friend or relative they are looking for, they can at least offer their prayers among their neighbours.